United Yacht Sales New Jersey would love to guide you through a personal showing of this 47' Bruckmann 47 2000. 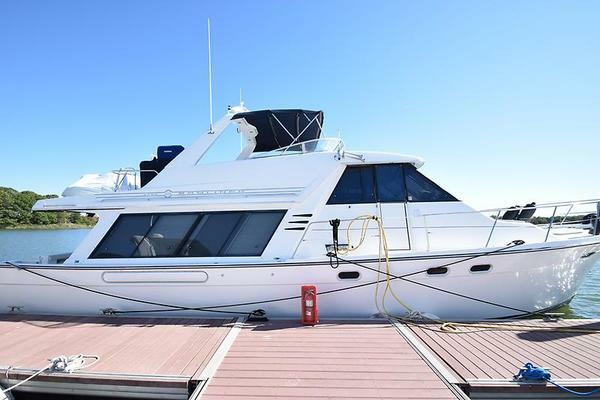 This yacht for sale is located in Portsmouth, Rhode Island and priced at $349,000. For a showing please contact us by filling out the form on this page and we will get back to you shortly! A spacious V-berth stateroom is forward, with ventilation and light provided by an overhead hatch and opening ports. Storage is in a cedar-lined hanging locker to port and aircraft-style lockers outboard and above berths. This cabin has plenty of standing and changing room. Aft to starboard is an en-suite head (new, 2011). The main salon is spacious and open, with abundant natural light and ventilation. A U-shaped dining area is to starboard with comfortable seating for six. Storage is provided in lockers above and outboard of the dining area. The dinette can be converted to a double berth. A straight settee to port provides additional seating. This is also an excellent sea berth. Louvered lockers are above this settee for additional storage.Cushions in the salon are dark blue Ultrasuede, which compliment the Herreshoff-style interior with white bulkheads and varnished mahogany joinerwork. Lighting below is from Cantalupi fixtures. Teak and holly cabin sole. The U-shaped galley is located aft of the dining area to starboard. Deep double sinks are on the centerline. The galley is equipped with Sea Frost cold plate refrigeration (compressor, 2011) with access above or below, a 3-burner Force 10 propane stove with oven and spacious Corian counters and storage space. Across from the galley is the nav station with a proper size chart table facing forward. The electric panels are next to the navigator’s seat; radar/chartplotter, VHF stereo and tank tender gauges are also located here. Aft of the navigation area is a large head (new, 2011) with a separate shower area, which doubles as a place to store wet foul weather gear. This head is easily accessed from the cockpit, salon or aft cabin. The aft guest cabin is on the starboard side. It is spacious, with a double berth and plenty of foot room to change and maneuver. There is locker storage outboard and above the berth, and a large hanging cedar-lined locker to starboard. There is a separate wet locker outboard of the shower area. Fiberglass hull with core-cell core. The topsides are Navy Blue (Awlgripped, 2012), with a white cove stripe and white boot stripe. The bottom is red.